Milagros - also known as an ex-voto or promesas - are religious folk charms that are traditionally used for healing purposes and as votive offerings in Latin America. In Spanish, the word milagro literally means miracle or surprise. Milagros come in a variety of shapes and dimensions and are fabricated from many different materials, depending on local customs. For example, they might be nearly flat or fully three-dimensional; and they can be constructed from gold, silver, tin, lead, wood, bone, or wax.They are they are often purchased in churches and cathedrals, or from street vendors and then attached to altars, shrines, and sacred objects inside place of worship. 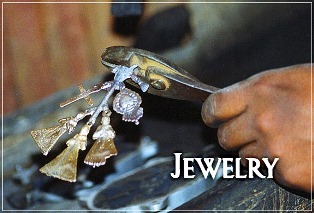 Our selection of milagros is vast and may certainly be used in the traditional manner. They also lend them selves to much creative use, such as in beaded jewelry, sewn on jackets or hats, or placed in photo frames. Additionally, our other jewelry items, such as necklaces, earrings, bracelets, and charms are fun and fanciful adornments for many occasions. Handcrafted in the US, Latin American, and India, they are all created in the finest folk art tradition. Frog, Beaded, with pin attached, Handmade in Guatemala, Jewelry accessory, 2.5"
Beaded Bracelet, Magnetic Clasp, Turquoise, Multi Strand, Shabby Chic, Jewelry, Handmade in Guatemala, 7.5"
Beaded Bug, Beetle Collection, with pin Attached, Unique, Whimsical, Handmade in Guatemala 1" x 2.5"
Beaded Bug, Beetle Collection, with pin Attached,Handmade in Guatemala 1" x 2.5"
Beaded Bug, Beetle Collection, with pin Attached, Lady Bug, Handmade in Guatemala 1" x 2.5"
Beaded Fish Collection, Multi-Color, with pin Attached, Small Figurine, Brooch, Fisherman, Handmade in Guatemala 2.75"
Beaded Fish Collection, with pin Attached, Small Figurine, Brooch, Fisherman, Handmade in Guatemala 2.75"
Beaded Fish Collection, Brown Tones, with pin Attached, Small Figurine, Brooch, Handmade in Guatemala 4.75"
Mayan Arts Handmade, fair Trade Bracelet Made with Seed Beads from Guatemala, Magnetic Clasp, multicolor, 1.25" x 6.75"